An interface defines the signature operations of an entity, it also sets the communication boundary between two entities, in this case two pieces of software. It generally refers to an abstraction that an asset provides of itself to the outside. The main idea of an interface is to separate functions from implementations. Any request that matches the signature or interface of an object may also be sent to that object, regardless of its implementation. Since it does not matter which implementation of a specific class is used, a class can be exchanged easily without changing the code of the calling class. 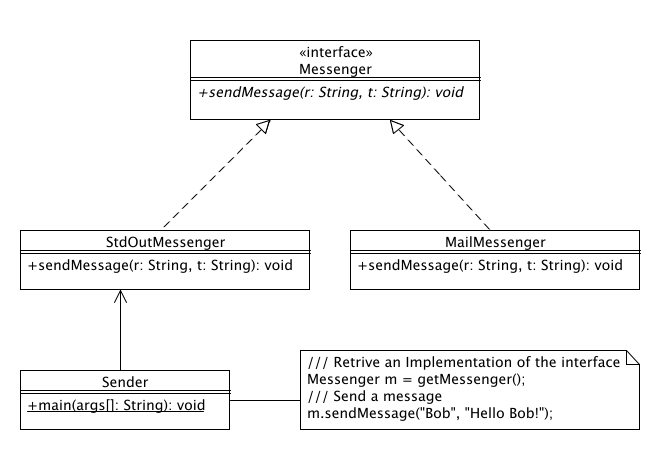 The concept of an interface is fundamental in most object oriented programming languages. In some, objects are known only through their interfaces so there is no way to access an object without going through it's interface. Many other patterns use interfaces, a lot of them depend on the interface pattern. It is possible to combine the interface pattern with virtually any other pattern to make them more flexible. Such a construction of using an interface is often combined with the Factory-Pattern to retrieve the Implementation of the interface.